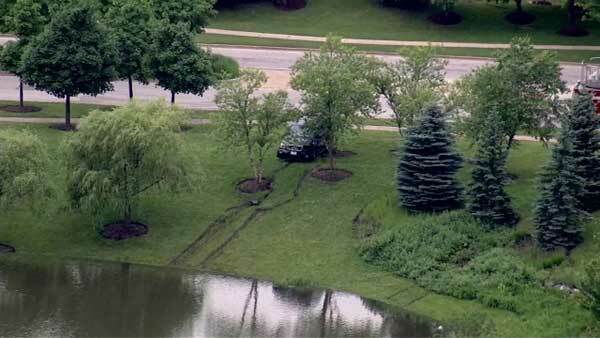 AURORA, Ill. (WLS) -- Police say Maria Ramirez, 31, and her 9-year-old son Ronaldo, died from injuries sustained when their SUV plunged into an Aurora retention pond after a car crash on June 17. Police say Maria succumbed to her injuries on June 20 and her son died on June 21. The crash occurred on North Edgelawn Avenue just north of West Sullivan Road around 5 a.m. on June 17, police said. A 2003 GMC Envoy allegedly sped out of a business parking lot, hit a northbound Toyota Scion sedan waiting to turn into the lot and continued east into the retention pond, police said. The SUV went into the water about 50 yards offshore. Ramirez was in the car with her son and her 7-year-old daughter. Police rescued the girl from the pond with the help of another officer and a bystander who saw the crash and she was taken to an area hospital for non-life threatening injuries. The driver of the Scion was also treated for non-life threatening injuries. Aurora Police are investigating the cause of the crash. An online fund has been set up for the surviving members of the family.